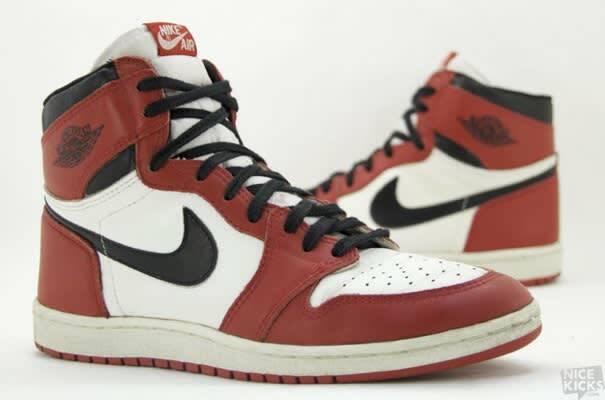 • The Air Jordan 1 kicked off the greatest sneaker line in the history of shoes. MJ accomplished some memorable feats in this shoe, including grabbing 1985 Rookie of the Year honors, receiving an All-Star game selection, and placing third in the league in scoring (28.2 ppg). For all of MJ's on-court accomplishments, this Peter Moore-designed sneaker gained most of its notoriety by being banned by the NBA. NBA commissioner David Stern fined MJ $5,000 for each game MJ wore the shoes, a tab Nike gladly paid in return for the abundance of attention surrounding the signature start-up line.